Looking at Sting in the flesh, it's nearly impossible to believe he turns 60 a week today. Lean, muscular, tanned and looking ridiculously fit, he has just returned from a bike ride around his adopted home of New York City. Years of clean living and yoga have left him with the body and energy levels of a man half his age. Perhaps unsurprisingly, the former Police front man is also struggling with the fact he is about to enter his seventh decade. "I can't quite believe it," he muses from his apartment balcony overlooking Central Park. "It doesn't quite compute for me being 60. I still feel like I am 14. "I think I have maintained my curiosity about the world and my sense of wonder at it. If that is what feeling young is about then I feel young. I am not jaundiced by the world - I still find it fascinating. "I am one of the more fortunate individuals on the planet so I can't be anything but grateful. But I can't get my head around that many summers and winters." Sting is talking ahead of the release of a retrospective 25-year collection of his solo work, out as a box set this week and as a single and double CD on October 14. In an age of ever-more disposable pop stars and fleeting singles, the singer and multi-instrumentalist is proud of a body of post-Police work that began with the jazz-influenced hit 'Dream of the Blue Turtles' in 1985 (making it actually 26 years, but who's counting?) and over nine studio albums has wandered effortlessly through genres from rock to pop, worldbeat and even classical. "Most of us only get three 25-year blocks in a lifetime so it's kind of significant to think it's a third of your life," he says. "So I think it's worth registering and looking at from that retrospective point of view, seeing what you have achieved in the 25 years and whether you have put your talents to good use; just to look back and say, 'OK, I haven't done badly'. I certainly had a good time living those 25 years." Sting was born Gordon Sumner, the eldest of four children, in the working-class city of Newcastle and still bears traces of the area's distinctive accent. His father Ernie was a milkman and engineer who gave no clues as to the prodigious musician his son would become and certainly no encouragement. 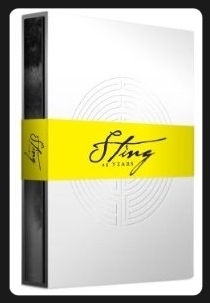 Indeed the only compliment Sting got from his father was from his deathbed. "He was a man of few words, Ernie, and I think he would rather die than praise me," Sting says of his father, who died of cancer in 1987 and subsequently had the 1991 album 'The Soul Cages' dedicated to him. "But on his death bed we talked about hands - we have exactly the same hands. I mentioned this and he said, 'Yeah, but you used your hands better than I did'. That was a huge thing for him to say to me, but at the time I was devastated." Does he then attribute his focus, drive and ambition in some part at least as an attempt to win the love and respect of his parents? The singer, now a father of six, leans back, and pauses. "We are always seeking attention and seeking to be noticed and you want your success to mean something to your parents," he says. "But that's a hole you will never fill - you can never really feel you have done enough. My dad has been dead for nearly 25 years now so I am not sure what I am doing and who is watching but I still have that engine of wanting to succeed." Some of his own brood have followed in his footsteps. Son Joe, from Sting's marriage to actor Frances Tomelty, is now lead singer in the rock band Fiction Plane, which supported The Police on their Australian reunion tour. Daughter Coco, from his marriage to actor-producer Trudie Styler, fronts rising British electro-pop act I Blame Coco. Sting says he didn't encourage them to enter the music business but always urged them to practice and play for their own sake and treat music as its own reward. "They certainly watched me practice day-in and day-out, so they do that and they work hard," he says. "It's a spiritual path, it's not about getting famous and rich. Of course they say, 'Well you are famous and rich - that's easy for you to say'. But regardless of that, it's true; it's a spiritual path." Sting describes his continuing desire to create and perform music - he has just finished writing a musical based on the death of the steel industry in his home town and is about to set out on another US tour - as a compulsion, almost bordering on a mania, that began at an early age. "It was more an obsessive compulsive disorder. I used to sit for hours on end playing scales and riffs with my mother saying 'Shut the f--- up - play something different'," he chuckles. "It was an escape but I didn't know what it was an escape to; it just felt like a compulsion that I needed to satisfy. And I was rewarded for that because I did practise a lot and music became my life. I think it always was - from the first moment I picked up a guitar at the age of seven and could knock out a tune on it, I started writing songs." For all his success, awards (11 Grammys from 38 nominations) and vast wealth (he has an estimated worth of $275 million), Sting insists he is first and foremost a student of music. A frequent collaborator over the years, from Dire Straits to Bruce Springsteen to Nicole Scherzinger, he is always seeking to learn and has always surrounded himself with musicians he considers better than himself to force him to lift his game. "I want somebody to teach me something," he says of his frequent side projects. "I sit in a room with a musician thinking, 'Teach me something'. I don't say that but that's how I look at it. I go, 'I hadn't thought of that particular view before, or harmony'. I don't listen to music to relax; you won't see me lying on the sofa going, 'Wow'. I'm sitting there thinking, 'Hmmm, I could steal that idea and put that there'. Again, it's an obsession." But one thing fans are unlikely to see is another Police reunion. After years of saying no, the singer and bass player of the top-selling trio of the '70s and '80s finally relented and reunited with former bandmates Andy Summers and Stewart Copeland for a successful world tour in 2007 after more than two decades apart, but Sting feels another is highly unlikely. "I don't think so," he says. "I don't think there would ever be a need to do it again. We did what we did. "We played to a lot of people and pleased a lot of people - but it wasn't that easy. It's difficult to go back when my instinct is to always move forward. I did it initially because I thought it would be a surprising thing to do. It surprised the other two, it surprised fans, it surprised the media and it surprised myself." The Police reunion was indeed a marvellous, unexpected suprise for many and, speaking for myself, a dream come true which not only pleased me but overwhelmed me with undisputed joy. But it didn't have to mean to "go back" only. It could be (or should have been?) a chance for three extraodinary and extremely talented musicians to teach & learn again from each other, to create again beautiful music, to leave again trace of the perfect alchemy that underlies every single work of theirs, without necessarily being the prima donna. None of them probably wanted to and never will. But we are here to celebrate Sting's brilliant solo career, and so I join the million fans in my truly hearted congratulations. Thank you Sting! I particularly enjoyed the part where you , Sting describe lying on the sofa and trying to reinvent or rethink a harmony ... We all have our funny little ways , and that was a very relatable statement . I hadn't ever before imagined about the musical mind, and how different notes, and melodies must sound to you. Very cool. Thank you for sharing.